Where Will You Feel Release & Conclusions? The Law of Attraction promises that our feelings guide our thinking as we create our lives. Lunar energy is astrologically in charge of how our human emotions play out down here below. 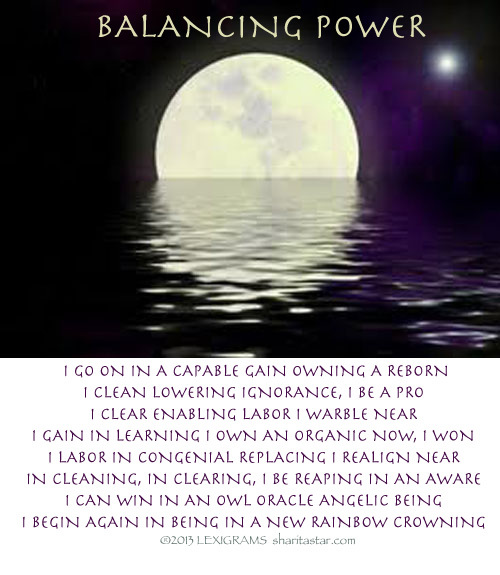 Each month, a New Moon marks a waxing cycle of beginnings while a Full Moon unfolds a waning cycle allowing release. LunarOScopes capture this natural rhythm, offering specific forecasting advice that times when it is best for your Sun Sign to initiate or reflect. Being our Moon changes Zodiac Signs every couple of days, so too do our feelings down here below mirror these precise patterns from above. Keeping our emotions healthy is what allows us to properly manifest our individual lives, depending upon where these cycles unfold within them. This two-week cycle favors letting go, review, redo, reflecting and healing energy to be seen throughout one half of your Zodiac Pie until the next New Moon of 2015 arrives in Aries. This Zodiac Month, we have an extra special Total Lunar Eclipse that will extend this month’s normal waning phrases effects for six months up to a year’s time. Especially under our monthly Waning phases, Moon VOCs promote a “double layer cake of reflection” to be adhered to. You will not wish to plan, plant, purchase or initiate anything of importance is when the Moon is Void of Course. This astrological passage occurs every couple days during our business and workweek, marking the critical request to take up in more reflective acts in solitude and engaging in quieter soul activities. Check in weekly with Empowerscopes on Empower Radio for all Moon Void of Course times. ARIES: It’s time to focus upon release where I Relate. You’ve been well aware of what is letting go concerning your partnerships, whether business or personal. Make careful decisions with changes connecting to your career. Ideally, who sticks around are people who support your creative nature, and value that you are approaching your life differently. TAURUS: It’s time to focus upon release where I Serve. Plenty of heads up has already come your way about the habits, routines and service to your health and the world that are all intensely leaving your space. Know your beliefs play the most important part of restructuring here. Rely on those who understand you the most in your home and family life. GEMINI: It’s time to focus upon release where I Create. Wrap up current projects and get ready to see powerful creative changes as well with any children. Transformation finds you and may arrive from other people’s financial means, but carefully examine the details. Plenty is channeling into your mind and communications, so write down what you need. CANCER: It’s time to focus upon release where I Nurture. It’s all in time right now to honor what must now be let go of so renewal can be seen within your home and family life. There is a calling to your partnerships, which require your understanding. Still, there are valuable ways what you are parting with is bringing in some support to your earning power. LEO: It’s time to focus upon release with how I Communicate. There’s no need to hold on to worn out ways of thinking and expressing your mind any longer. A refreshing restructure arrives to your habits & routines equally asking for your attention. Yes, life on the approach really does look different for you, and the world is happy to see your new appearance. VIRGO: It’s time to focus upon release with what I Have. You have been very aware of this time arriving to be able to let go of possessions and material things you no longer need. Energetically, you will be freer to create- if you listen carefully to that time you are asked to spend alone to hear the right messages. Pay attention to what your dreams may tell you. LIBRA: It’s time to focus upon release with who I Am. That balance you’ve been longing for now says it’s time to even out your scales, but you must relinquish control of old approaches to your life. Connect to the matters that bring strength to your home and family life. Equally, your hopes, wishes & future goals will also get involved if you socialize. SCORPIO: It’s time to focus upon release where I Process. There is a huge calling to take time to honor your solitude, so make sure you schedule it- and bring a journal with you- there will probably be plenty you’ll be inspired to write down. Oddly enough, this soul homework opens up energy that speaks the most to your career and public life about change. SAGITTARIUS: It’s time to focus upon release where I Socialize. Should friends, hopes, wishes and future goals that just do not resonate with you any longer leave now, don’t be surprised. Your role in groups and organizations speaks of changes concerning your earning power, so see what value this has for you. Remember, your beliefs are all part of this shift. CAPRICORN: It’s time to focus upon release where I Structure. Now is the time to captivate what you must understand about changes concerning your career and public life. Let go, and honor that your life is not meant to have the same approaches that it used to. Hold on to the faith there is a new wealth coming into play for you that will fully regenerate you. AQUARIUS: It’s time to focus upon release with what I Believe. Whatever you used to philosophically hold dear, know it’s time to grow in a different direction. It is your time alone that allows you to hear what you need to in a silent listen. When you have those answers, it will be your partnerships that open your doors to understanding these changes the most. PISCES: It’s time to focus upon release where I Transform. You already have felt the rebirth, but a deeper sense surrounds this lunation that energetically casts off a regeneration to make you recognize wealth is far beyond what finances represent. Seeing now that your future goals are attainable, keep learning more to serve your habits, health and routines. When a Total Lunar Eclipse equally peaks in the intuitive energies of Libra you’ll see an extra force calling for careful listening to know how to guide understanding in what is releasing and asking to be healed from in this area of the life. This completing energy unfolds for an extended period of time after the waning phase ends 18 April, where the effects of letting go can last as long as from 6 months up to a year. Energy completes, releasing healing and reflection within this half of your Zodiac Pie throughout 18 April. If you’ve been following the Full Moon’s since 06 November’s peak at 14 degrees Taurus, you’ll notice they all have continued at the same 14 degree point of their sign. Once again this month, we are at the 14 degree mark of Libra- and this now will be the last Full Moon at the 14th degree of the sign for quite a long time. As the full definition of the 14 was given in 06 November 2014’s LunarOScope, it represents the Chaldean’s understanding of Movement – Challenge. As the 14 reduces to the singular vibration of the 5 through the guidance of Mercury, all of our Full Moon’s since November have intensely called for us to recognize what not only needs to emotionally release every month, but the tremendous request for true permanent change accompanying every challenge keeps knocking at our Full Moon doors in every sign since from Taurus. 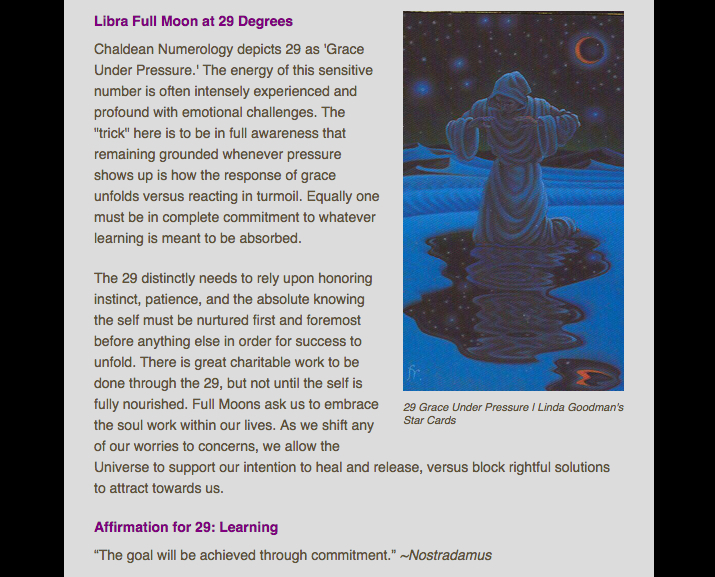 For the 6th month in a row movement is tremendously doing the same from Libra, completing the 14’s requests. This Full Moon in Libra speaks with ease to Jupiter Retrograde on it’s station to go Direct 08 April in Leo. Once again we are still brought face to face with our ultimatums from 2014’s Grand Cardinal Cross, and last month’s finishing pass of the Uranus Pluto Square Dance in motion since June 2012. We find this Libra Lunar Eclipse and Full Moon squares Pluto at 15 degrees Capricorn- opening the conversation up to see what emotionally is left to transform and finally release between these two leadership signs so our foundations can continue to be built for the future. As always with a Full Moon our Sun is in natural opposition to it, and equally is involved as well with shedding light squarely over to Pluto, as the Grand Cardinal Cross is revisited once more. As Jupiter Retrograde at 12 degrees Leo still holds a loose trine to Uranus at 16 degrees Aries, it picks up light as well from our 14 degrees Aries Sun. The enthusiasm emerging between these fire energies, speaks with great understanding to Libra’s Full Moon & Lunar Eclipse to bring in an intellectual flavor to assist in seeing both sides of the issues and make necessary changes accordingly as peacefully as possible. As Leo and Aries have created a recent optimism about change, perhaps the real peace of mind we have all been looking for -to truly be able let go within the Libra area of our lives- will gracefully find it can now fall into place. Our Lunar Lady is about to gain her first of three full nights in Spring. Knowing our Sun is alive in pioneering Aries, the Moon will naturally have its’ luminous show in the opposition of Libra. The collectives’ emotions enter The Scales Monday 29 March at 7:21amEDT until Wednesday, 31 March at 8:41amEDT. We know with any Full Moon our feelings have the tendency to become intense. When you have the Sun and the Moon in a “full” on opposition to one another- you can expect one of two things: resistance or co-operation. This month, as the Sun reaches Aries at 09 degrees (urging our independence and self-image), the Moon equally asks that we take time to filter through our emotional take on relationships and harmony, as she opposes in complimentary Libra at 09 degrees. Anytime our Moon is lit up to capacity, rest assured our Sun is trying to take things in a completely different direction and doesn’t think there is any time for reflection. Ideally, oppositions are a wonderful gift from the Universe, for they ultimately help us naturally strive for balance. The more we tend to fight or bury our feelings upon a Full Moon, the more “loony” things will seem to get. Be open to the request of our Full Moon in Libra. Think of the Aries determination of self shining its’ light upon the charm of Libra who isn’t interested in being alone. This is a collective calling to look to matters concerning peace, tolerance, understanding, and friendliness. Refined feelings and the capacity for comparison and co-operation are strong. Be aware however of lazy, evasive, and co-dependent reactions. 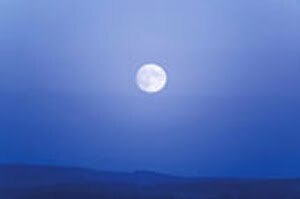 A Full Moon in Libra brings forth a sensitive instinct and imagination. Your Libra piece of your personal Zodiac Pie will point to where you will feel intensity this Monday evening, as well as the area of life to focus upon release and reflection for the next two weeks til our next New Moon upon 14 April. For the collective horoscope, again we offer advice for every sign from the outer vantage point. Remember, if you know your Rising Sign (Ascendant), read that passage too, for it typically will apply to your personal charts’ advice -but this is not an absolute- depending upon the mathematical lay-out of any individual chart. Aries: You’ve been getting a little preview since last fall of the next couple years ahead about those closest to you, personal or business related. As Saturn currently sits on the doorstep of this area of your life, he’s asking you to take a good look around and let go of what no longer works. By the next New Moon, you’ll have made the proper room to take on some new values and earning potentials. Taurus: Where can you improve your routine, personal habits, and health Bull? We know you like to take your time, so recognize this opportunity as the beginning of a long-term process in these areas. Take a look at the way you are being of service to others, for there is improvement to be made. Don’t try on any stubbornness, for you’ll really appreciate the peace you will receive later on. Gemini: The Twins are in full gear making something new! Whether united or divided, that artistic or creative adventure you’ve been putting all your cleverness into looks for a completion. Children may be on your mind, or require your focus now. Love affairs may also be entering upon the stage of your life, and you are anxious to figure out whether they’ll become part of the set, or be striked. Cancer: Not that home and family aren’t always on the Crab’s radar, but there are issues concerning them that will find a release now. The Career should be sparkling, but remember there is still balance you need to achieve where you refuel. You love a good déjà vu – and the ones you’ll receive now have an extra special instinctive message to share with you. Leo: Time to re-organize your thinking your Royal Highness. You’ve been a little caught up in the preview of the next couple years, but every Lion knows it’s only best to think positive thoughts. It’s been rough too with Mars on your back in the last few months, but as it now moves forward, take charge! Taking time in reflection to write, educate, or learn has you well prepared for the clear and responsible head you will need to rule your forest in the near future. Virgo: If you’ve been in a fuss or worried about the earning power- this is the first thing to let go! Now is not the time to attract more worry, but refine those detailed oriented skills you have that love serving others. Your value system has seen the beginnings of the redecorating process that will unfold in the next couple of years, and now is the time to reclaim your securities, granting them proper room to grow. Libra: You always show the prettiest side of your Scales, and now, there is more weigh to carefully add to them. New approaches and letting go of what doesn’t fit into your beautiful and friendly world is the mission at hand. There is some new relations waiting for you, but the only way you’ll be introduced to them is if you let the world begin to see a new side of you now! Scorpio: You’re quiet comfortable in the subconscious realms that this Moons’ energy wants to take you to regal Eagle. You’ve been sensing it deeply since last fall, but now, it’s time to go even further within, as some matters of the subconscious wish to be resolved now. Enjoy the mystery of this one, because this time, it’s all about you. Sagittarius: There’s some people or things to bring your attention to in your friendships and organizations. Realizing and reflecting upon the recent roles you’ve played in your groups right now allows your wishes the room to blossom later on. You’re preparing yourself for the ultimate responsibility here in the next couple of years ahead, so don’t lose your focus before completing the task at hand Dear Archer, be sure to look before you aim! Capricorn: You are worried aren’t you old Goat? Career matters are on the surface right now, and decisions need to be made on where it is all going. There’s been a lot of feelings coming on since last fall about where it’s all headed, but now, the final reflection unfolds. Your purpose, mission, and reputation all are awaiting significant changes. Don’t wait for your expectation of perfection in this case- as the time is now to make these necessary reassessments for the long term. Aquarius: There’s been a stir of responsibility in your philosophical outlooks since last fall, some of which even the prophetic thinker like you couldn’t foresee coming. There’s an important a trip that’s either finishing now, or you better get to making plans for one! Don’t deny that urge now to travel, even if it is only in the mind as you take on a pursuit that brings you to higher education. Pisces: If you have some lingering financial revisions, it’s a good time to bring some new life to them. Investments, taxes, shared/joint resources, any of these are well deserving of your attention right now. Don’t keep swimming away if you’ve been feeling a lack of intimacy lately. Take some time in this area to venture into safe new waters and make some sensual waves.